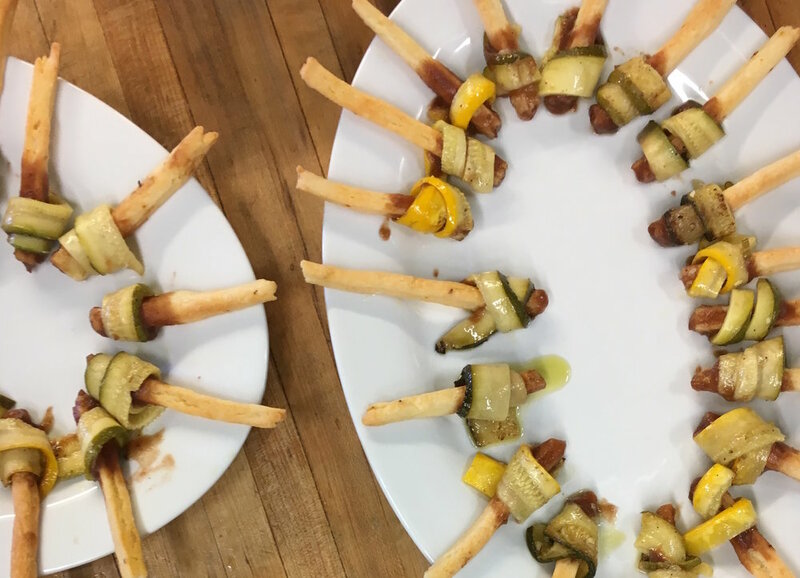 Here is a standout hors d'oeuvre idea with a fun presentation. The preparation comes together pretty quickly, especially if you make the cheese straws in advance. These tasty treats will go fast, so be prepared with back-ups. Prepare the cheese straws and let cool. Season the squash strips with salt and pepper, then sear on one side in a hot, lightly oiled skillet. Remove immediately. Squeeze fresh lemon juice and drizzle a bit of olive oil over the squash. Open your jar of smoked apple butter and pour into a bowl. To assemble, dip a cheese straw into the apple butter to coat the top couple of inches. Wrap one strip of the squash around the coated part of the cheese straw and place on a serving dish. Continue to dip and wrap, dip and wrap, dip and wrap.